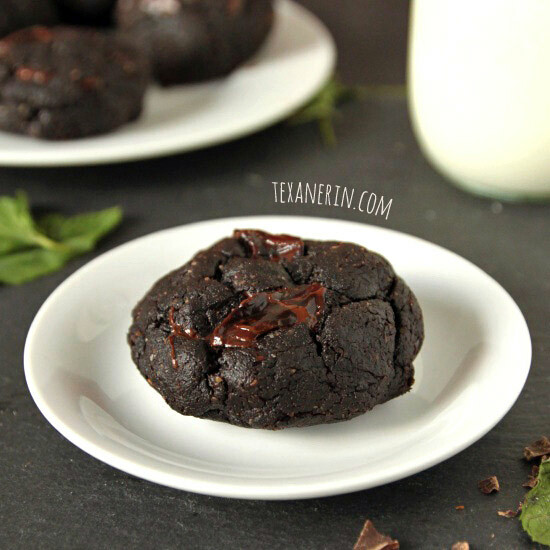 These paleo mint double chocolate cookies have fresh mint in them and are super rich and gooey! They’re also grain-free, gluten-free and dairy-free. Sonia, the creator of these grain-free chocolate mint cookies, is a genius. I actually made her recipe less healthy (added 2 tbsp of honey + an extra tbsp of coconut oil + waaay more chocolate) and added fresh mint. And After Eights in the middle. If you want to keep these mint chocolate cookies paleo, omit those or use these, which look paleo-compliant to me. Each cookie is like an individual brownie. And not just any brownie, but a totally fudgy, decadent and sinful one. Healthy tasting? No way. Although, I do have to admit, they lose their ooey gooey magic when they’re not warm. When they’re not warm, you can indeed tell that they’re not “normal” cookies. Just pop one in the microwave for a few seconds and all will be solved. But they’re still pretty flippin’ awesome at room temp! And even with my changes, they’re still super healthy. There’s a whole avocado in there! Dates to sweeten (and the little honey I added) and hazelnut meal. But you can’t taste any hazelnut flavor. When I bit into one, I almost cried. They are glorious. One thing to note is that you have to use the chocolate chips and eat them warm if you want them to taste like normal cookies. And I know you do! I figured out last year that I don’t like fresh mint, but because mint extract doesn’t exist here, I thought I’d try these anyway using the fresh stuff. And I thought it made the batter taste like dish soap (not that I’ve ever tried eating dish soap). I stuffed the cookies with After Eights and everything turned out dandy. I left some of the dough plain, meaning no chocolate and no After Eights and I highly recommend not doing that. Lots of chocolate, okay?! And if you prefer using extract, that’s no problem. Use about 1 teaspoon. Or just leave out the mint entirely. Preheat your oven to 350°F (176°C). Mix the first four ingredients in a medium bowl and set aside. In the bowl of your food processor, add the rest of the ingredients except for the chocolate chips and After Eights. Process until very well combined. It should be smooth and creamy, but there will still be little specks of dates. Add the dry mixture and pulse until combined. Take out the blade and stir in the chocolate chips with a spoon. Chill in the refrigerator for at least one hour. Form the dough into about 30 balls and place half of them on a Silpat or piece of parchment paper. Flatten the balls and then break each After Eight in two so that it'll fit in the center of the cookie. Place each After Eight centered on top of each dough disc. Flatten the remaining balls of dough and place on top of the After Eights. Seal the edges so that the After Eights won't ooze out. Bake for 8 minutes and then immediately remove the Silpat or parchment paper from the cookie sheet (with the cookies still on there). I did this to make sure that they didn't bake even longer. 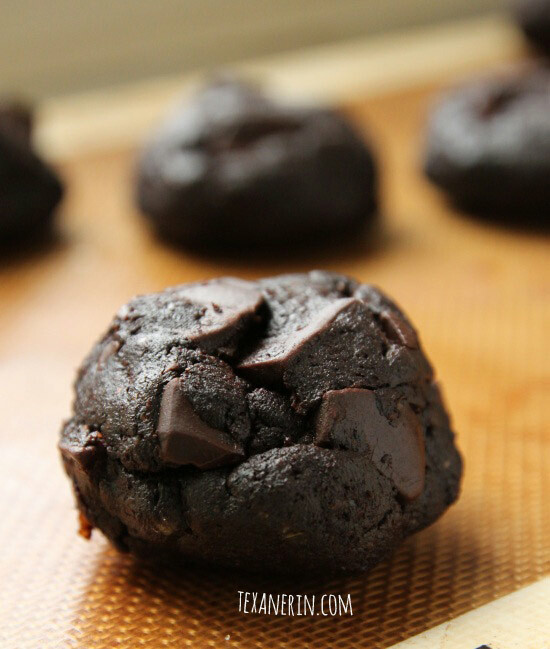 68 comments on “Paleo Mint Double Chocolate Cookies” — Add one! Hi Erin! Over a year later, and I’m going to finally try to make these. Silly food sensitivities – I could not have eggs for all that time and now I’m ok with eggs but have a problem with vanilla. Do you think they would be ok if I left the vanilla out and used regular cacao powder (the good organic kind)? I also have some “chocolate mint” I’m going to use out of my mother in law’s garden. Can’t wait to finally try these! Hi again! You can definitely omit the vanilla and I imagine regular cacao powder would work fine. The cookies may taste a little different but since I haven’t tried it, I can’t say for sure (but everything I just read said that they’re interchangeable). Thanks for linking up to the GAPS-friendly mints! They sound great as does your mother-in-law’s chocolate mint. :) I hope you’ll enjoy the cookies! Hi Erin, just wanted to get back to you and let you know that I made these yesterday (sans vanilla and with regular organic cacao powder). They are SOOOO delicious! I can’t stop eating them! Thanks so much for the fabulous recipe – will definitely be making them again. Hi Erin! Baaaack again. I love these and they are part of my regular rotation. But now I’m trying the blood type diet and have to find an alternative to avocado. Any thoughts on a good substitute? Thanks so much! Hey there! :) I have no idea as to a substitute but you could make these paleo peppermint cookies instead. :) I like them even more! “Because I really had to.” Haha. I have that issue right now and have been for the last 3 weeks. “I’m just going to cook with XYZ one last time!” ;) Good luck with your diet! These look amazing! I have two boys that allergic to many foods… (peanut,treenut, egg, wheat, soy, strawberry, tomato soy and dairy) can I substitute anything for the hazelnut meal? Thank you so much for your response. Because of my son’s peanut and tree nut allergy, yes, all nut flowers are out of the question. But sunflower seed flower is something we can definitely use!! Thanks so much again! I cannot wait to try this recipe! They look crazy amazing dense, rich, thick, gooey, wonderful…and cannot believe they're 'free' of anything! You outdid yourself! It's not always easy to cook GF but clearly not a problem for you! You made me crave After eight now… :-P I haven't seen them here anywhere. I guess Peppermint Patties will have to do. These cookies look incrediblyyyy delicious! Yes, I'm a sneaky one. People seem to like gooey chocolate. :) Hope you'll like the cranberry cake! These look wonderfully gooey and fudgy! Love that you used fresh mint! These cookies look perfect, so rich and delicious! 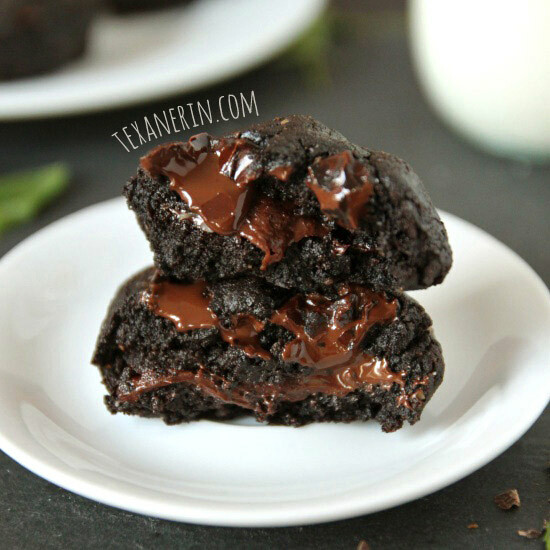 Oh my – a lightened up brownie cookie? Where do I sign up?! But not light in taste or texture! They're super heavy and dense. Like someone else said, stone cookies. Yeah! These look anything but boring. Oh, that gooey center is calling my name. Yum! Haha. Doesn't stop me either. I wish I had some kind of stop-eating-the-cookies switch! The avocado is such a surprising ingredient! Next week, my gluten-intolerant friend is coming for a visit so I plan to try these cookies. Since we don't have hazelnuts, I plan to substitute almond meal. Thank you! Looking forward to sinking my teeth into these chocolatey cookies! I have to say… I love your name. :) I hope you and your friend enjoy these cookies! I'd love to hear how they come out with almond meal. I love your enthusiasm for these biscuits! They're a must try now! I am totally going to have a go at this with some almond meal… and you best believe I'm loading it up with chocolate :) thanks for sharing this great recipe! Haha. Good girl. :) Load 'em up. Hope you like them! Let me know how the almond meal works out. Holy cow those look insanely good! You can't get anything better than all that ooey, gooey melted chocolate! oh my goodness, girl! I could eat these all day long. HOLY MOLY. "When I bit into one, I almost cried." – honestly feel like that would be my same reaction. I mean, look at them. All of that melty chocolate makes me want to skip dinner tonight and faceplant into dessert. amazing photos and great job with these Erin! I am so, so, into these. They look awesome! I've noticed most chocolate cookies kind of taste a little dry when they aren't warm. Someone needs to invent a homemade chocolate cookie that stays soft and chewy and delicious at room temperature… but then again I don't eat my cookies cold either. And I had no idea fresh mint tastes like dish soap. Whenever my mom puts a mint leaf on my dinner I usually just pick it off and leave it on the side. AWESOME!!! OMG, what a lovely surprise! I'm so happy you liked them, Erin! This is like the best compliment EVER! I have to admit that the added chocolate chips make them look so much better, with all that extra gooeyness. YUMMERS! What I wouldn't give to taste one right now. Well, two, to be honest. I wouldn't mind having a taste of the raw one either! Looks scrumptious!